Firewise Communities/USA is a unique opportunity available to America's fire-prone communities. It is a dynamic, flexible process that reduces a community’s vulnerability to damage from wildfire. It requires citizen participation and guidance from representatives of the wildland fire community and can be tailored to the City of Beverly Hills to ensure maximum wildland fire protection and education for our citizens. Its primary goal is to encourage and acknowledge action that minimizes home loss to wildfire. The purpose of this recognition program is to recognize communities that have significantly reduced the potential for wildland/urban interface home loss. Furthermore, it will teach residents to prepare for a fire before it occurs. The program will encourage a hands-on approach through which homeowners participate in crafting local solutions to their unique wildfire threats and issues. 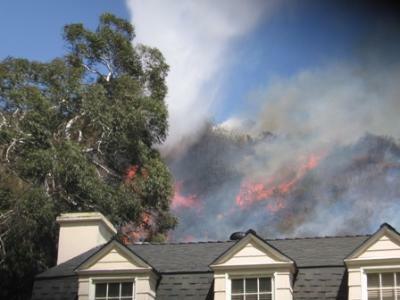 All efforts will be designed to help homeowners live safely and in harmony with nature and its fire regime. Citizen involvement will be the cornerstone of a successful Firewise Communities/USA program. Residents will have an important opportunity to play a vital role in shaping the community plan and participating in its implementation. Wildland fire staff from federal, state or local agencies provide a community with information about coexisting with wildfire along with mitigation information tailored to that specific area. The community assesses its risk and creates its own network of cooperating homeowners, agencies and organizations. The community identifies and implements local solutions. Enlist a wildland/urban interface specialist to complete a community assessment and create a plan that identifies agreed-upon achievable solutions to be implemented by the community. Sponsor a local Firewise Task Force Committee, Commission or Department which maintains the Firewise Community/USA program and tracks its progress or status. Observe a Firewise Communities/USA Day each spring that is dedicated to a local Firewise project. Invest a minimum of $2.00 per capita annually in local Firewise projects. (Work by municipal employees or volunteers using municipal and other equipment can be included, as can state/federal grants dedicated to that purpose). Submit an annual report to Firewise Communities/USA that documents continuing compliance with the program. This program will provide a workable fire protection framework by instituting a process for a wildland/urban interface fire protection program that encourages local solutions to the issue of unwanted wildfire. It will educate citizens about wildfires and the associated subject of home ignition. By implementing the program standards, citizens will participate in a management approach that ensures they have timely, accurate and useful information. In addition, it will improve a community’s sense of civic responsibility by requiring citizen commitment to maintaining a Firewise environment. In essence, participants will work together with fire and emergency personnel to develop strategies for protecting themselves and their property. For more information, please log onto www.firewise.org.